From Wall Street to Silicon Alley, our location across from New York City creates endless opportunities for your personal and professional development. Prepare to be inspired. 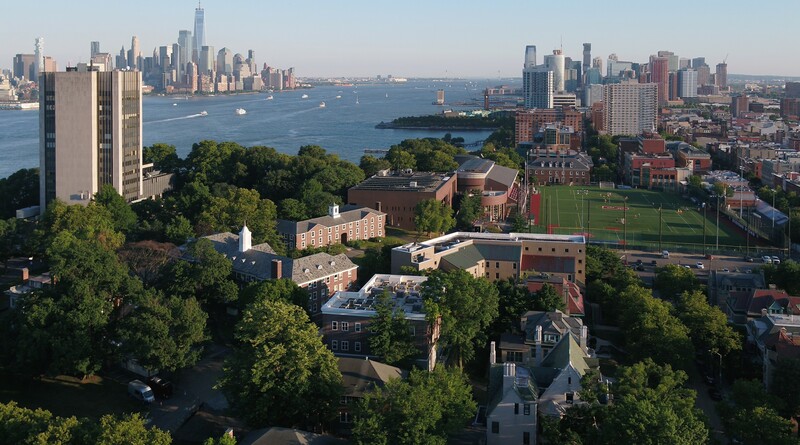 The Stevens campus commands an awe-inspiring view of New York City, located just 10 minutes from our Hoboken home. But at the School of Business, our location is more than just a pretty backdrop. Our proximity to Manhattan colors your entire student experience — from network development and internship opportunities, to cutting-edge curricula and cultural wonders. Recruiters from Fortune 500 companies are a regular feature of campus life, owing to our proximity to industry and the valuable set of skills taught in the classroom. Executives from the world’s largest finance, life sciences, technology and media companies provide input on courses, engage with student consultants and offer firsthand insights on business trends during guest lectures. Our location also puts the many cultural delights of New York City within easy reach. Whether your passion is sports, theater, museums, parks, the arts or great food from any corner of the globe, you’ll find it’s all a few short minutes from Stevens. And Hoboken — a small, safe city regularly ranked among the nation's top college towns — is a fun place to live, with many parks, a walkable downtown and countless restaurants within easy reach of our campus. Our location puts you at the doorstep of incredible career opportunities in the world's most in-demand industries. Our proximity to Wall Street makes Stevens a go-to choice for managers seeking tech-savvy employees and groundbreaking research insights. The city's tech hub eagerly seeks employees who can find answers in the data and align their recommendations to strategic goals. An emphasis on analytics prepares prospective consultants to work with the most exciting clients in any industry. You can study business anywhere. The reason to do it at Stevens is to be in Hoboken, just minutes from the world's greatest finance, technology, media, healthcare, retail and publishing companies. Our location puts recruiters just 10 minutes from campus, which means you’ll have countless opportunities to meet hiring managers from every industry. Upon graduating, you’ll join a network of professionals whose expertise in analytics, technology and finance makes you a hot commodity in the job market. Stevens business graduates are in high demand on Wall Street, at startups and in the Fortune 500. Your classes aren’t just taught by accomplished researchers. Many times, you’ll learn from an industry leader who brings decades of experience to the classroom. And you'll have access to real company data and leadership through the Senior Design experience, the graduate Field Consulting Program and active corporate advisory boards. "Here, you’re so close to the headquarters of the Fortune 500, making it easy not only to get interviews, but to meet with and learn from alumni." "Having Manhattan right there means everything is close to home — banks, tech companies, anything you could want for your career." "Having Manhattan right there was so important, as a student, but it was also great to live on an actual college campus in a small city like Hoboken."